Events to watch in the worlds of politics and business as you start the workweek. 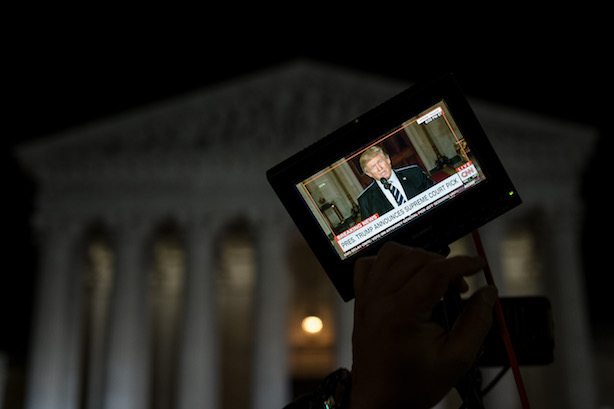 Watch this space today, part one: High political drama is set for tonight in prime time when President Donald Trump reveals his pick to replace Justice Anthony Kennedy on the Supreme Court. Broadcast TV networks will break in to regularly scheduled programming to carry it live (Deadline). Trump has reportedly narrowed his shortlist down to two potential choices (CNBC). Watch this space today, part two: Martin Sorrell has reportedly sweetened S4 Capital’s bid for MediaMonks by offering the Dutch agency’s executives significant equity in his new holding company (City A.M.). S4 has been in a bidding war for the Amsterdam-based digital production shop with Sorrell’s former place of business, WPP. Nissan acknowledged on Monday that its plants in Japan have been falsifying emissions data, making it the latest in a string of automakers to become ensnared in an emissions scandal. Nissan’s revelations came to light after a company-wide compliance audit launched last year after allegations of misconduct (Fortune). Starbucks said this morning that it is planning to phase out single-use plastic straws from all of its locations in two years, eliminating 1 billion plastic straws each year (CNN Money). Instead, the coffee-maker will offer recyclable lids and straws made from paper or compostable plastic (CNBC). Bad news if you’ve been pulling for Hope Hicks to return to the fray. The former White House communications director has reportedly told associates she has no plans to work for the Trump administration at least through 2018 (Daily Beast).